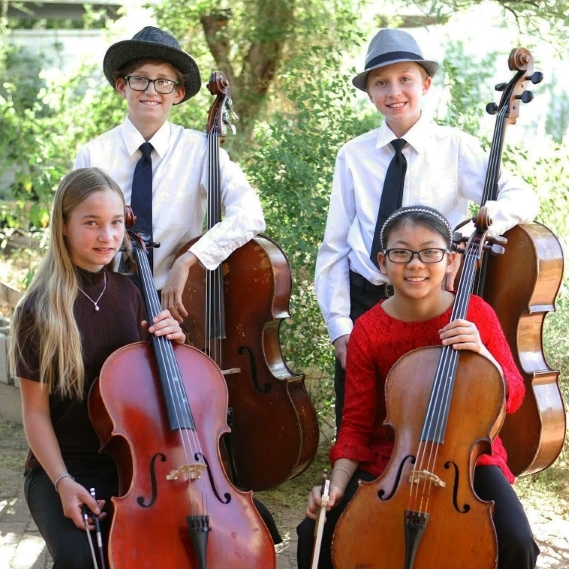 The Cellobration Cello Quartet was formed in spring 2018 when I was asked to provide an outstanding young cellist for a local concert series. Four cellists sound even better than one, so the idea of a quartet was formed. A name had to be chosen quickly and Cellobration sprang to mind-we even had some pictures taken in party hats! Cellobration rehearses every other week and is working hard to learn a large and varied repertoire of music. The quartet has performed in public a couple of times, but their official debut will be on April 11, 2019, at 12:15 at St. Philip’s in the Hills Episcopal Church’s Lenten Concert Series, where they will perform a full length recital. Please come! Hopefully more performances will follow! Thanks to the Civic Orchestra of Tucson for encouraging young musicians to play in small ensembles. There’s nothing better than playing with friends! Sarah Joy Roland (age 12) is a homeschooler who has been playing cello for six years. In September 2018 she performed with Arizona Symphonic Winds in a Vivaldi concerto for two cellos with quartet member Mei-Mei Turner. She is the sixth of eleven children and enjoys making music with her siblings. When she is not practicing her cello, Sarah can be found out riding her horse, or curled up in a corner reading a good book. Mei-Mei Turner (age 12) began the cello in the studio of Mary Beth Tyndall when she was six. Mei-Mei has won a number of competitions including 1st place in the Civic Orchestra of Tucson’s Young Artists’ Competition twice. In 2018 she performed with COT at Reid Park. She was also a winner in the Tucson Symphony Young Artists Competition and the Cello Congress. She performed with Arizona Symphonic Winds a couple of times along with fellow cellist Sarah Joy Roland. In 2018, Mei-Mei had the privilege of attending Rocky Ridge Music Camp in Estes Park, Colorado. She also studies the piano, tap dancing, and acrobatics. Lee MacDonald (age 14) has been playing cello since he was seven years old. His first cello teacher was Dr. Theodore Buchholz and he currently studies classical cello with Mary Beth Tyndall, jazz with Nick Coventry, and piano with Dr. Kyungsun Choi. He loves to play Bach as well as tour around the southwest with his brother playing old time fiddle, bluegrass, and jazz. Lee has played in numerous competitions over the years, including the TSO’s Young Artists Competition, COT’s Young Artists’ Ensemble Division, the Tucson Cello Congress, and the National Oldtime Fiddle Competition in Weiser, Idaho. Lee regularly plays in the duo Young MacDonald and his newly-formed band Copper Wren. In October 2018, he and his brother recorded their first CD, “Poundcake”, for which Lee created the original artwork. He hopes to pursue a career as a cello teacher and a performer. Bradley Breen (age 13) is an 8th grade student at Esmond Station K-8 in Vail. He has been playing the cello for five years and enjoys studying with Mary Beth Tyndall. Bradley has participated in numerous festivals and competitions including the Tucson Cello Congress, ASU Cellobration, Arizona Elementary Allstate Orchestra, District Honor Orchestras, the Civic Orchestra of Tucson’s Young Artists’ Competition, and the Tucson Symphony Young Artists Competition where he was a finalist in 2017. Bradley has also been a member of the Vail Youth Symphony since 2014. Bradley is also a talented percussionist and has performed with the Tucson Jazz Institute on drum set and enjoys playing with his school band and “gigs” around Southern Arizona. Bradley looks forward to attending Empire High School next year as a freshman.